This post is a few days overdue, as are several more that I hope to get to. I wrote last a week ago, from Gettysburg, briefly describing our visits to Antietam and Gettysburg battlefields. I will have more to say about that. This post is about our attendance four nights ago at the Mariners baseball game. We got back home from Washington, D.C., Tuesday night. It wasn’t entirely the best timing that last month we had arranged with Gail’s sister to attend the Mariners game Wednesday night against the Tampa Bay Rays at Safeco Field. I figured I would be falling asleep by the third inning. But worse, it was cold. Just four days earlier, back in Maryland, we toured Antietam National Battlefield in 90 degree heat and high humidity. The weather was only slightly more tolerable Sunday and Monday, summer having come early to the mid-Atlantic coastal region. All I could think was, I’m sure glad I live in a more temperate climate. Ha. It was in the 40s most of the day Wednesday. When we arrived at Safeco around 6:00 PM, it was probably the warmest and sunniest part of the day, over 50 and beautiful. We headed up to the third deck along the first base line to grab dinner. 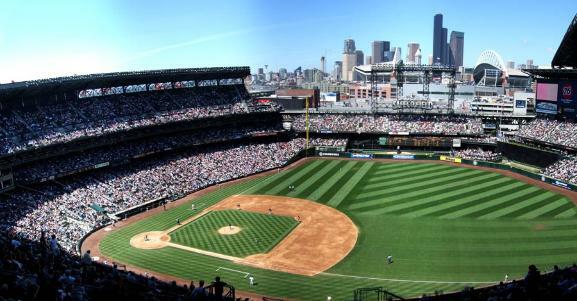 This is the part of Safeco that provides the best views: west over Elliott Bay, the Sound, and the Olympic Mountains; north to downtown. It was also the warmest part, in direct sun. After eating, we walked over to the first base line to get to our seats. The sun was still high enough to sit above the top of the third base roof, so we were still in sunlight, with commanding views over the field and to downtown. Of course, at that height, the players are pretty small, but it’s a great outlook. And then, round about the 4th inning, the sun disappeared from view. It got cold really fast. Here it is, May 5th, a gorgeous evening, but a cold one, with temperatures now in the mid 40s, and all I could think was, maybe DC’s climate isn’t so bad after all. At least we were winning, and Cliff Lee was dominating through four. When we scored 2 runs in the bottom of the fourth (see box score here), one could imagine that might just be enough. But Lee weakened in the top of the 5th, gave up an equalizing pair of runs, and one wondered if we would score again. Lee was in command again the next two innings. If we could just get a run across, we might win. Though mostly I was rooting to get home. Lee ran out of steam in the 8th, giving up 3 runs. No way we were going to win now. Perhaps this was a good time to leave. Many of the 14,627 (officially) in attendance seemed to think so. We stuck it out through the bottom of the 8th, then through some mis-communication between Gail and me, we stayed into the 9th, when the Rays got another 3 runs. If you’re keeping track, you’ll know the score was 8-2 at this point, entering the bottom of the 9th. I said okay, we should at least go down to the first level and watch from there as we work our way to the exit. We did so, and suddenly the Mariners had loaded the bases. We got a run, then Sweeney ended the game by striking out. We were near the exit at this point and made a hasty retreat. I’m so glad we no longer have to watch the Mariners play in the Kingdome, that awful concrete bunker of a building. And I’m so glad that even though Safeco was built with a sliding roof that can keep rain out, the roof is more like an umbrella, leaving the interior open to the outdoor air at all times. In principle, This was, however, one of those nights when watching indoors might not have been so bad. My one regret in all this is that we didn’t get to see the Nationals play in their new ballpark when we were in Washington. I was there most of a week, but that week coincided exactly with a road trip. As we flew back to Seattle Tuesday night, they opened a home stand.